We offer competitive soccer for ages 10-18 (grades 5-12) for both boys and girls. Our season runs August – October, and we play in local leagues as well as tournaments. Please click on Soccer to learn more about our teams, schedules, leagues, and cost. We offer competitive soccer for ages (grades ) for both boys and girls. Our season runs from , and we play in local leagues as well as tournaments. Click on Basketball for more details on teams, leagues, schedules, and cost. The Rochester Rapids are a competitive sports program for home educated students, based in Rochester, NY. Our programs strive to coach the players both physically as well as spiritually, as we try to grow young men and women who are effective on and off the field. We receive our insurance through GRLeah, so membership is required for participation. Our programs have been successful in our leagues as well as helping to grow excellent Christian men and women. Please browse around our site to get a feeling for our soccer and basketball programs. If you have any questions about the Rochester Rapids, do not hesitate to contact Irv Salisbury at irv@greenGoby.com or (585) 766-5103 for assistance. Our soccer teams are competitive teams that play in area leagues, with some participating in regional and national tournaments. Teams are available for boys and girls in the 5th-12th grade, ages 10-18 who are educated at home. Insurance is provided through membership in GRLeah, which is required for playing on a Rochester Rapids team. The season begins with practices in early August and ends with league tournaments at the end of October. Practices are Tuesday and Thursday evenings, as well as Saturday afternoons. Games are on Tuesdays and Thursdays, and we do our best to arrange all the teams to have home games on Thursdays together, with away games scheduled on Tuesdays. Our soccer teams practice and have home fields at Grace and Truth Sports Park (map) in Greece. Each team has its own cost for the season, but the ballpark price is around $150 for the season. Details for each team are in the sections below. The coordinator for the Rochester Rapids Soccer Program is Irv Salisbury. He can be reached at irv@greenGoby.com or (585) 766-5103. The Boys Varsity Tournament team is our most competitive Boys Varsity Team. They participate in the WNYCAA league just like our league team, but they also travel and play in tournaments, which is an additional cost to participate on this team. All Boys Varsity players tryout together, and the top 14-16 are selected depending on the number of players for that year. The team is comprised mostly of 11th and 12th grade players, but 9th and 10th graders make the team as well. The season begins officially with practices in August, and games and tournaments through October. Practices are Tuesday and Thursday evenings from around 5-7 PM (varies slightly as year goes on), and Saturday afternoons from 1-3 PM. Games are usually Tuesday and Thursday evenings, but an occasional Monday night game happens as well. We have optional once a week indoor practices in the offseason from January – May, and optional outdoor get togethers in July. The Boys Varsity League Team is comparable in many ways to a Junior Varsity team. It provides a competitive arena for players who did not make the Tournament Team. Our Boys Varsity League Team plays in the WNYCAA league, and has mostly competitive games in that league. Usually there are a few teams that they are overmatched against, but the majority of their games are competitive, and they even win a few of them. They practice with the Tournament team, so receive the same instruction, and are challenged throughout the year because of this. The Team is mostly comprised of 8th, 9th, and 10th grade boys, but it often has a few 11th and 12th grade boys who become team leaders and mentors to the other boys. We have many success stories with young men who started out on the League team and became starters and key contributors on the Tournament team. The season is the same as the Tournament team, going from practices in August through the league tournament at the end of October. Practices are Tuesday and Thursday evenings from around 5-7 PM (varies slightly as year goes on), and Saturday afternoons from 1-3 PM. Games are usually Tuesday and Thursday evenings, but an occasional Monday night game happens as well. Players on the League Team are invited to the optional offseason practices with the Tournament Team. The Girls Varsity Tournament team is a competitive Varsity team. They participate in the WNYCAA league just like our Boys’ teams, but they also travel and play in tournaments, which is an additional cost to participate on this team. The team is comprised of mostly 9th-12th grade girls, but depending on year sometimes 8th grade girls can be brought up. The season begins officially with practices in August, and games and tournaments through October. Practices are Tuesday and Thursday evenings from around 5-7 PM (varies slightly as year goes on), and Saturday afternoons from 1-3 PM. Games are usually Tuesday and Thursday late afternoons, but an occasional Monday evening game happens as well. Our Co-ed Modified Teams are for boys and girls in the 5th-8th grade, ages 10-14 who are educated at home. They play in a local Christian School league for modified teams. Each year we evaluate how many players we have, how many will be needed to fill the Varsity teams, and then decide how we will arrange the Modified Teams. We have been blessed to have enough players for two teams the past three years, and we pray that will continue. We have tried dividing up the players based on skill level, as well as dividing up the teams evenly. Each year will be evaluated separately and announced before the season begins. Our teams are very competitive in their leagues, having won it a few years, and being runners up in others. Our Modified Teams are an excellent starting point for your son’s or daughter’s soccer experience. The Rochester Rapids basketball program is for members of Greater Rochester LEAH home educated youth in grades 5-12. We have boys & girl’s varsity, junior varsity, modified, and 5/6th-grade basketball teams: colors are black, dark green, and white, nickname – The Rapids. The program was started in the fall of 1994 because home-educated youth have no scholastic athletic opportunities as they progress into the upper grades. NYS Education regulations do not allow a home-educated youth to participate on a public school athletic team, nor will they will allow Section V teams to compete against a homeschool team such as the Rapids. We are comparable to a Section V Class C/D level school. good for us because they are usually competitive and local. We complete our season by attending the very competitive NCSAA Basketball Championships at Mt Vernon Nazarene University in Mt Vernon, Ohio. This tournament is optional & requires travel & overnight stay. The Boys JV Team encompasses grades 7-11 Most of the teams we play in the north division of the Varsity league also have JV teams. These games will all be doubleheaders with the JV team playing prior to the Varsity. The JV team will also play some local CYO teams and tournaments. There are no JV playoffs but we usually enter a local tournament or 2.
opportunities that will challenge them in a more competitive environment. This could include local leagues/tournaments and only the “Select” modified team will play these games. We practice & play our home games at St Jude’s; 4100 Lyell Road in Gates, NY 14606. This is one of the finest gyms in Monroe County. The practices start in November & will run from 3:45 to 5:45PM. JV & Varsity will practice on Tuesday & Thursday. We will practice 2 times a week through Thanksgiving, and then once or twice a week as the game schedule permits. Modified & 5/6 graders will practice together on Monday & Wed. They will practice twice a week through Thanksgiving, and then once & occasionally twice/week as the game schedule permits. Dads are always welcome to come & watch or help with practice, if so inclined. Parents & siblings are not permitted to watch practice unless you make arrangements with the coach ahead of time. Siblings are not permitted to play in the gym or balcony during practice. Last Year the JV & Varsity had a total of about 24 practices and the Mod/5/6 grade had about 15. The JV & Varsity practice at the same place/time. Some drills are done together but much of the time the teams will be working separately with their own coach’s. We maintain a maximum of 10-12 players on the team. If more than 12 players are interested in participating, we conduct a tryout session. Using a series of drills, the boys are evaluated on team/individual skills, offensive/defensive techniques, speed, agility, strength, conditioning, hustle & ATTITUDE. Candidates exhibiting the most skill or greatest potential are selected accordingly. If we have enough coaches & players, we will consider having 2 teams. The Varsity & JV play our home games at St Jude’s. We travel to Syracuse, Elmira, Dundee, East Aurora, & Olean. The games could be any night of the week except Sunday, but the majority of the games seem to end up on Tues, Thurs, Fri & Sat afternoon. Start times vary but are usually around 6:30 (12 – 2PM on Sat). Some Modified games will start at 4:00 and are almost always on Tues & Thurs. Select Modified games could be on a weekend. The Varsity played 30 games last year (counting 3 post season tournaments), the JV played 14 games & the Modified played 8 games. Mod Select played about 17 games. For Modified & JV, if a player is in good standing & is attending practices, they will play in the games. The PT will not be equally divided. For Varsity, prior to each game, the coach will determine the five players who will start and play the most minutes per game. Selection is based on observable skill level, game plan, practice attendance, and attitude. The remaining players will be used for substitutions. Some players may not play in a given game. Last year the fee for Varsity was $230, JV – $165, Mod Select – $150, 5/6 – $90. It depends on how many kids participate. There is a family discount for more than 1 player on the Varsity team. Fund raising options exist to help a player reduce his fee. Uniforms, gym time, league fee, officials. Varsity ref’s cost about $75 each per game and Gym time can cost about $75/hour. One varsity home game can cost $300. For questions please call: Mike Bushen @ 585-227-7669 home, or email at mmbushen@gmail.com. Registration is done at our Rochester Rapids Blue Sombrero site. Once you login, you will see a screen like the image below. Your participants that can register are listed and their available programs are listed next to them. If there is an open registration, it will appear here. 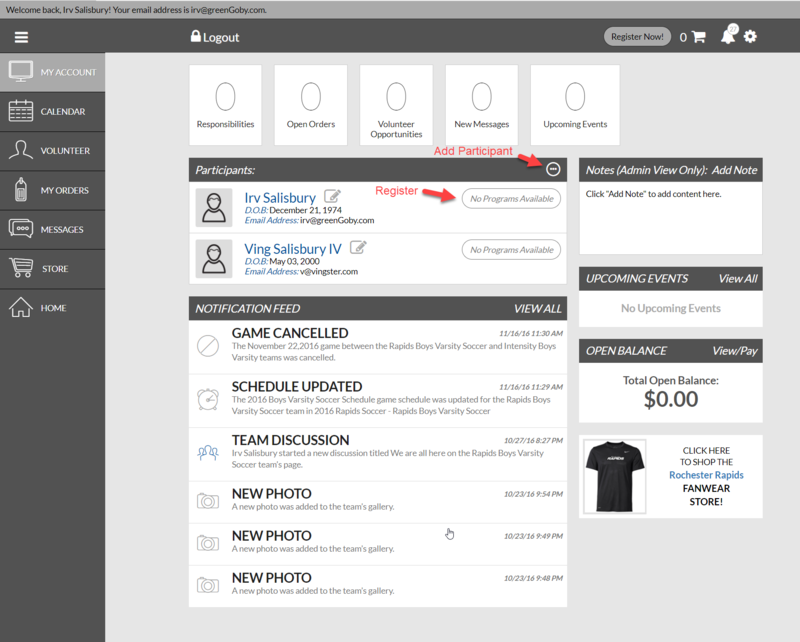 If you need to add a participant, you can do so via the … menu and selecting Add Participant. If you are not seeing an open registration that you expected, please contact Irv Salisbury at irv@greenGoby.com or (585) 766-5103. We have another fanwear store at Blue Sombrero here.